22″ 308 Winchester Load Development Part-2. This the second trip to the range working up a load for my 308 Winchester. On the first trip, I shot two, five-shot groups of each load. While it provides more data, I felt I was wasting time and money with the bad loads- last trip’s groups best group was .452″ and overall group size averaged .843″- not bad- but not great. This time around and being low on brass, I only shot one 5-shot (or in two instances, 3-shot) group for each load. I also worked up some Reloader 15 loads as well. I selected long proven match quality components: 175-grain Sierra Matchking (SMK) bullets, Lapua brass, Hodgdon Varget powder, Reloader 15 powder and Wolf large rifle primers. The Lapua brass I am using has been fired once in this rifle. Cases were neck sized, trimmed to length and cleaned in an ultrasonic cleaner. Charges were dispensed using an RCBS Chargemaster. Ballistic information was recorded with a Magnetospeed V3 barrel mounted ballistic chronograph. All velocity information presented below. All groups were fired prone, from a bipod with a rear bag. The load numbers are asynchronous and used as a reference in my reloading log books. The first group for load #6 includes the cold bore shot. Range conditions were overcast and 33F. No wind. 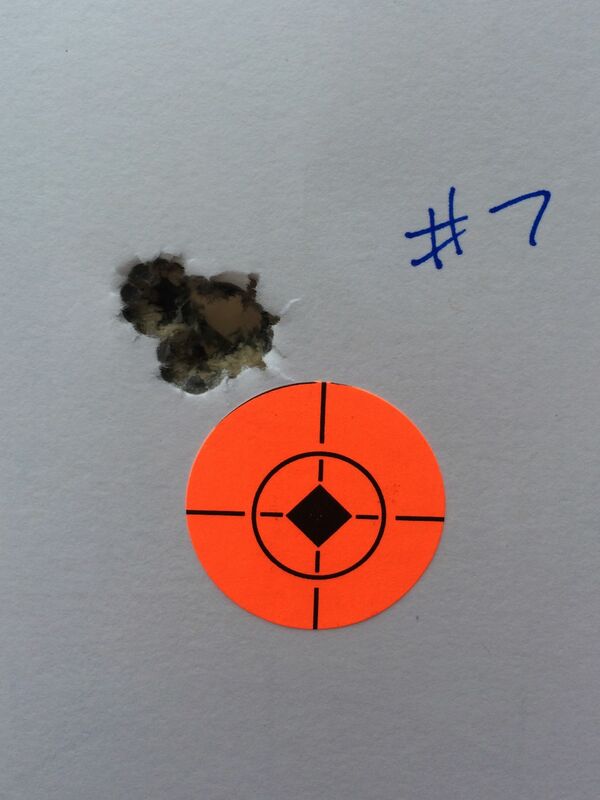 The best 5-shot group of the day, 280″ at 100 yards (.267 MOA). The rifle liked the higher end of Varget the best. The lower left group includes the cold bore shot. Here are all the groups I fired on this trip (above). It appears that my rifle prefers the higher end of Varget loads. The Reloader 15 didn’t give the velocities I was expecting, but it was pretty cold. I’ll be conducting further testing on load #7 at distance and see how it performs.